A new regulation aiming to protect peatland is likely to fall short of its goals. failing to stop peat degradation, emissions, and fires that are driving the current haze crisis in Southeast Asia, asserts a new analysis from Greenpeace. A new regulation aiming to protect peatlands is likely to fall short of its goals, failing to stop peat degradation, emissions, and fires that are driving the current haze crisis in Southeast Asia, asserts a new analysis from Greenpeace. The paper, published on Wednesday, argues that the new land regulation currently being discussed in parliament fails to take a holistic view of managing peatlands. For example, the regulation doesn't adequately protect shallow peat areas that may be connected to deeper peat domes. These peat domes, which are vast storehouses of organic carbon, are subject to collapse when their edges are drained and degraded. It also doesn't protect peat in existing concessions or mandate better water management in areas already converted for oil palm and timber plantations. Forest destruction in Riau Province, Indonesia on 06/23/2013. Greenpeace is calling on concession holders to urgently extinguish fires on their land, immediately stop the drainage and development on peat and natural forests and ensure palm oil in their supply chains is free from forest destruction. On a political front, Greenpeace says the peat regulation doesn't have the support for the Ministry of Agriculture, which plays a critical role in allocating lands for new oil palm plantations. "The overlap of mandates and responsibilities of different actors involved and the lack of involvement of key players such as the Ministry of Agriculture have led to a partial and diffuse approach to peatland management and protection with no coherent government action plan that integrates all relevant actions to effectively address the drivers of peat destruction," the group said. "The Peat Regulation will perpetuate that problem." But Indonesian President Susilo Bambang Yudhoyono is nonetheless pushing the regulation as part of his commitment to greening Indonesia's economy. As part of that effort, the president has set aside more than 14 million hectares of previously unprotected forests and peatlands, making them off-limits to new concessions. 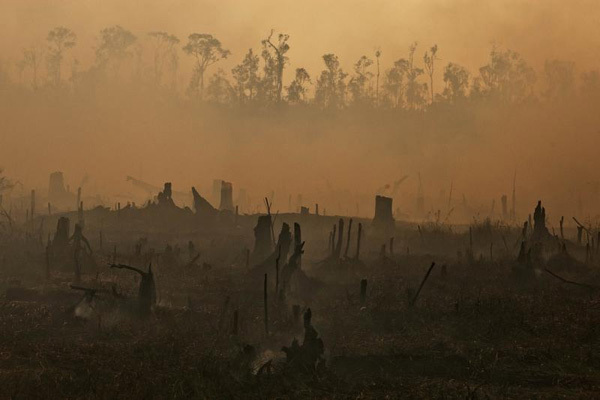 Degradation of peatlands and associated fires are one of Indonesia's largest sources of greenhouse gas emissions. 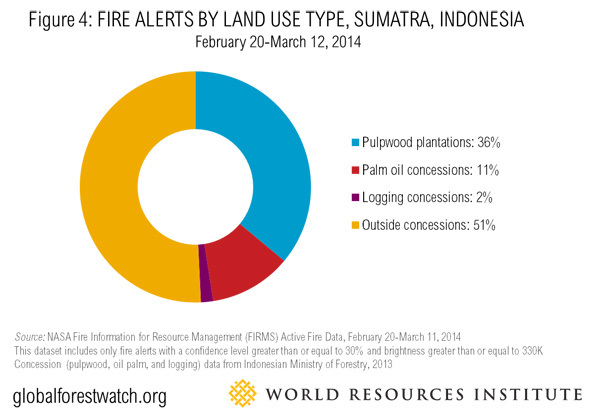 Fires also drive the haze that is causing the current air pollution crisis across much of Sumatra. Greenpeace analysis shows that more than 86 per cent of the fire hotspots occurring in the area protected under the moratorium are on peatland. Drained peatlands are particularly vulnerable to burning. Peat fires can smolder for months to years, exacerbating emissions and pollution. Establishment of plantations is the biggest cause of peatlands drainage and conversion in the areas where fires are presently being detected. Analysis released yesterday by the World Resources Institute found that about half of hotspots detected by NASA satellites during the past three weeks have been located in plantation concessions.